In what was a surprising move yesterday, the Fed dropped the Fed funds rate basically to zero, surpassing market expectations. Everyone fears deflation, and the Fed is willing to do whatever it takes to avoid it. But as Toni Straka from The Prudent Investor points out, these drastic moves could soon lead us to hyper inflation. Share and bond markets rallied on Tuesday after the Federal Reserve announced that it will give away new money for almost free, lowering the Fed Funds target range to a historical low of 0% to 0.25%. The Fed had cut the Fed Funds rate in late October by 50 basis points. The new record low rate is a reaction to to the de facto status quo in treasury securities where short maturities of up to 6 months trade at yields below the upper end of the target range. In a most unusual move the Fed provided publishable background on its decision, writes the WSJ blog, detailing it all here. The Fed has not held press briefings until now. While markets welcomed the bold move, gold, the canary in the mine of inflation, advanced as well, piercing the important resistance at $850. Investors are obviously pricing in that all Treasuries yield less than the inflation rate of currently 3.7% YOY. But the move to a zero interest rate policy will come at the cost of higher inflation in 2009 and 2010, it can be safely predicted. Chairman Ben Bernanke and his fellow Federal Open Market Committee (FOMC) members pulled out all stops in order to jumpstart the economy and assured market participants that the Fed would continue to engage in the dubious game of printing fresh money for collateral it does not want to talk about. Once more proving their image of inflationistas par excellence the FOMC said the Fed can be expected to hold on to its free money policy for quite some time and use all tools to promote a return to growth. But money for nothing alone will not help, the Fed reasoned, preparing markets for more growth in the Fed's balance sheet after it has exploded from $800 billion to $2.2 trillion since last summer. Expect the Fed to continue to buy more worthless MBS (mortgage backed securities) while substituting the banking sector in the commercial paper market. I translate this into "we will throw (fiat) money (that costs us next to nothing) on every problem as we did in the past 2 decades." See more worthless money created that will be exchanged for more MBS that are valued on a theoretical basis, i.e. not the market price which may be only a tiny fraction of the initial face value. The announcement that the Fed is looking into buying longer term US Tresuries raises immediate fears that the Fed will be monetizing the federal debt again after a portfolio shift towards MBS in the recent past. Any talk about deflation misses the point of unprecedented monetary inflation that will show up in the real economy 2009/10. Eric de Carbonnel argues at DollarDaze that monetary inflation does not even have to pump up money supply - my favorite theory - but that it is a loss of confidence that increases the velocity of money, resulting in the dange of hyper inflation. The record low official Fed Funds rate may be elusive though. Jake at EconomPicData sees a disconnect between municipal bonds and Treasuries, reflecting the horrendous outlook for cash strapped communities which had invested heavily in property debt. Now they are broke. 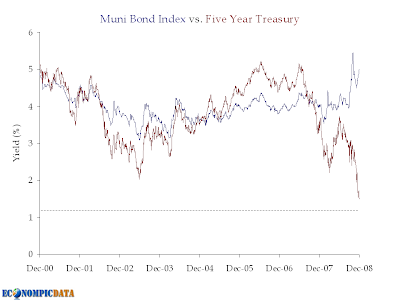 GRAPH: The yield spread between Munis and 5-year Treasuries soared to a record high of 325 basis points. Graph courtesy of EconomPicData. DollarDaze draws a historical comparison that shows deflation can be a hazy illusion. As an example of deflation leading to hyperinflation, consider the case of the Weimar Republic. In 1920, Germany experienced a deflationary collapse, with the average citizen finding it harder and harder to get enough money for necessities. Banks, short of money, could not honor checks, and businesses were strapped for cash to buy materials and meet payroll. Fearing a collapse that would throw millions of workers out on the street, the German government desperately printed money in an attempt to re-inflate the economy. During this period, despite the government's money printing, the mark actually gained in value against foreign currencies, so that prices of imported goods fell by some 50%. Eventually, as a result of the money supply's rapid expansion, the nation's massive foreign debt, and the shrinking economy, German citizens lost all confidence in their currency, and the Weimar Republic experienced one of the worst cases of hyperinflation in modern economic history. Check out the time series of the Weimar hyper inflation - with the interim "correction" before it went parabolic - here. The new policy to lend money to banks for free shows that the Fed is obviously willing to monetize all debt problems that come along. With its seven new financing tools introduced since the beginning of the crisis in August 2007 the Fed is already intervening in MBS markets and tries to keep the commercial paper market afloat. But after all these attempts are nothing more than new fiat money with a different ribbon. The road to hyper inflation is clearly visible as were most problems already more than 3 years ago. Time will show whether the Fed has been correct in its view of current conditions. Taking it from the past 15 months the Fed has been behind the curve despite its fast moves. It is to be doubted that the increasing readiness to prop up all markets with new money will mitigate the crisis. It will rather delay it but the point of no return comes closer with every day. Central banks have a bad record of containing inflation once they set the process into motion willingly. But these facilities have not brought the liquefying effect the Fed had hoped for. So far all attempts to revive credit markets have failed, observes not only Bloomberg, which has all the details on Tuesday's rate decision. This post can also be viewed on prudentinvestor.blogspot.com.